Dr. Vanita Prasad is an Environmental Biotechnologist with more than 20 yrs. of experience in related field. 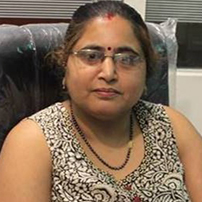 Having graduated in Science from University of Delhi, she completed her Master’s and Ph.D. in Biotechnology under Department of Biotechnology and Central Scientific Industrial Research, Govt. of India fellowships. Dr. Prasad has a long association with the industry as Consultant Scientist while heading R&D functions of various waste management companies. She hold patents for specific innovation in the field of Waste management and Renewable energy.